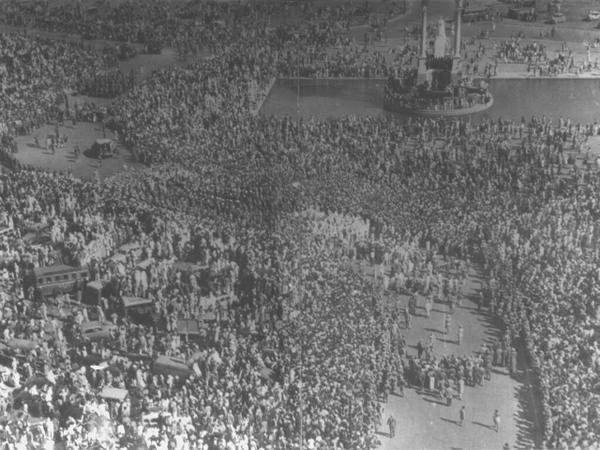 Home » Celebrities » Mahatma Gandhi's Funeral. By Sparky in Celebrities on September 19, 2009 . 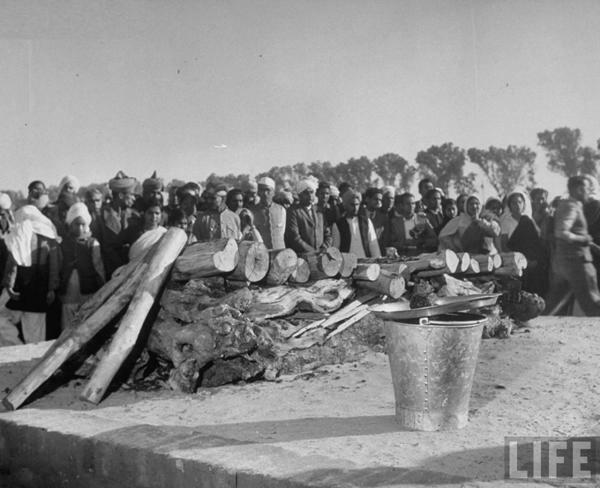 Mahatma Gandhi’s body lay on the pyre with his head to the north. In that position Buddha met his end. 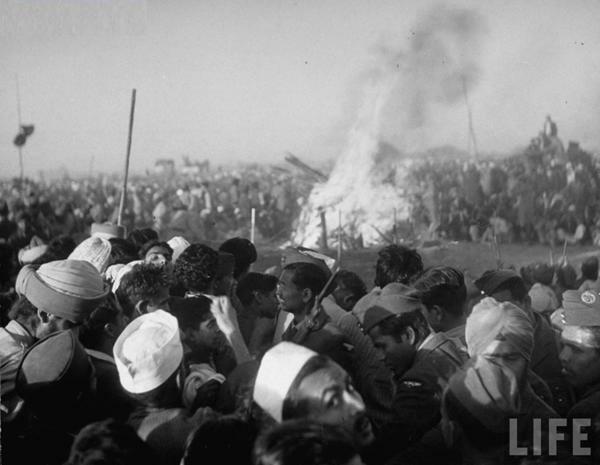 At 4:45 p.m., Ramdas Gandhi, the third son of the Mahatma, set fire to the funeral pyre. The logs burst into flames. The vast assemblage groaned. Women wailed; men wept. The wood crackled and seethed and the flames united into a single fire. Now there was silence. 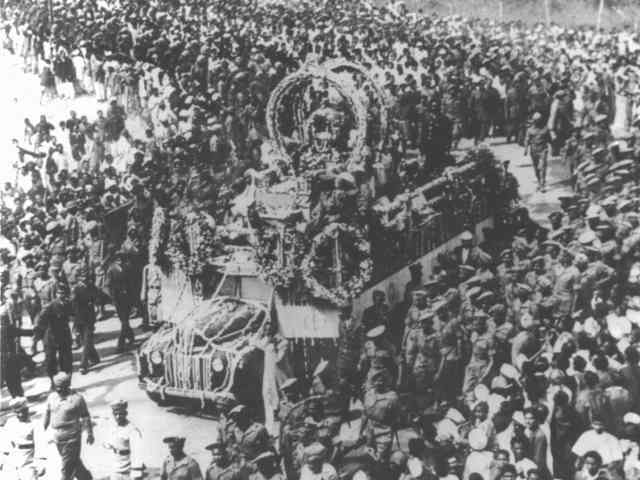 Gandhi’s body was being reduced to ashes and cinders. A nation’s father was dead. “If, as I believe, his spirit looks upon us and sees us, nothing would displease his soul so much as to see that we have indulged in any small behavior or any violence. Friends and comrades, the light has gone out of our lives and there is darkness everywhere. I do not know what to tell you and how to say it. Our beloved leader, Bapu as we called him, the father of the nation, is no more. Perhaps I am wrong to say that. Nevertheless, we will not see him again as we have seen him for these many years. We will not run to him for advice and seek solace from hi, and that is a terrible blow, not to me only, but to millions and millions in this country, and it is a little difficult to soften the blow by any other advise that I or anyone else can give you. The light has gone out, I said, and yet I was wrong. For the light that shone in this country was no ordinary light. The light that has illumined this country for these many years will illumine this country for many more years, and a thousand years later that light will still be seen in this country, and the world will see it and it will give solace to innumerable hearts. For that light represented the living truth … the eternal truths, reminding us of the right path, drawing us from error, taking this ancient country to freedom. A madman has put an end to his life, for I can only call him mad who did it, and yet there has been enough of poison spread in this country during the past years and months, and this poison has effect on people’s minds. We must face this poison, we must root out this poison, and we must face all the perils that encompass and face them not madly or badly but rather in the way that our beloved teacher taught us to face them. The first thing to remember no wish that no one of us dare misbehave because we’re angry. 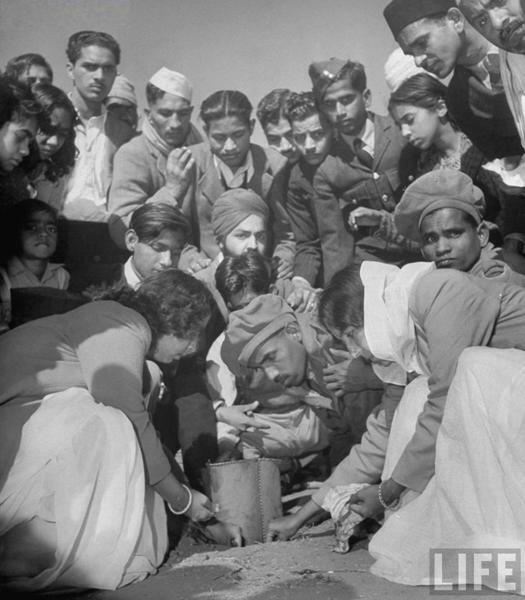 We have to behave like strong and determined people, determined to face all the perils that surround us, determined to carry out the mandate that our great teacher and our great leader had given us, remembering always that if, as I believe, his spirit looks upon us and sees you, nothing would displease his soul so much as to see that we have indulged in any small behavior or any violence. Nathura ram Vinayak godse really he has sacrified is life to our Hindu religion.my dear Hind brothers and sisters.. 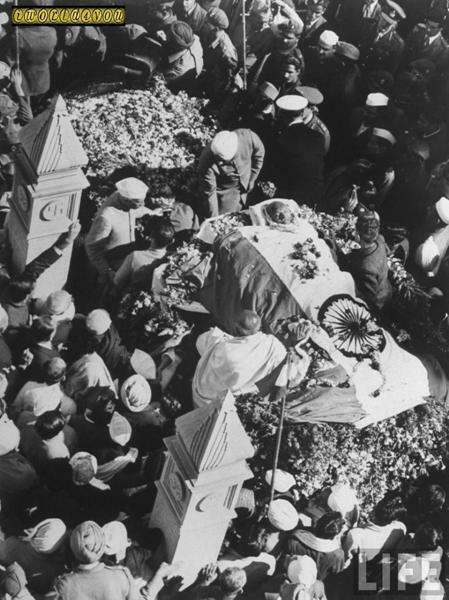 When did Mahathma Gandhis funeral. Happened? At what time.& which day? I guess you have not read history. You should read history and then I will watch if you will say heads off to this coward guy. Both of them did there job suspect and the victim. It is true how very sad this is, and what respect we owe this man. 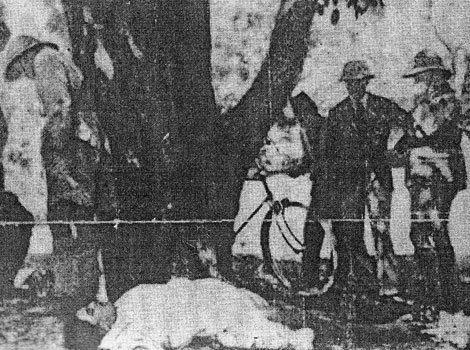 I heard that the man who shot him resented him for seeming to favor a rival religion. Sadness and loss can twist us into vengeful and blindly destructive beings. 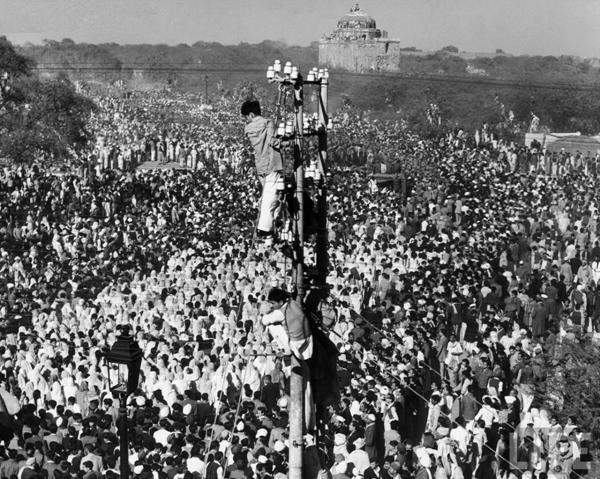 It was not him who got independence they were patriots who got independence he juts ruined India by making Jawaharlal Nehru as prime minister of India and so many other wrong things he did. 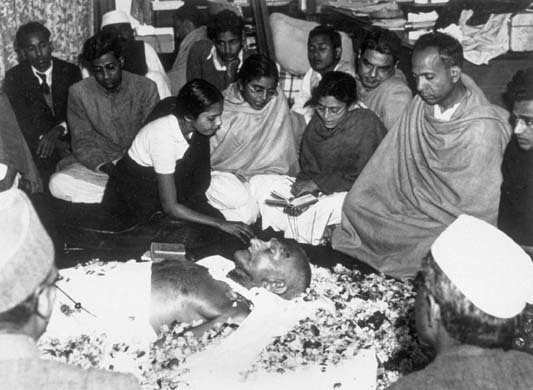 On Friday 30 January 1948, Gandhi woke up at his usual hour, 3:30 a.m. After the morning prayer he put the final touches to the new constitution for Congress which he had been unable to finish the previous night. The rest of the morning was spent answering letters. Someone mentioned the fact that despite his poor health he was working incessantly. ‘Tomorrow’, he explained, ‘I may not be here’. 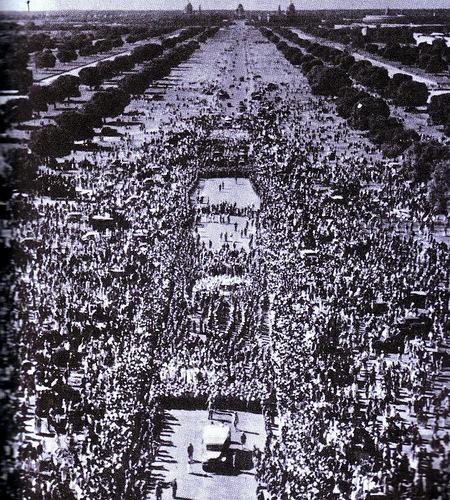 Gandhi would not permit those who attended the prayer meetings: ‘If I have to die I should like to die at the prayer meeting. You are wrong in believing that you can protect me from harm. God is my protector.’. He 's a great man..heads off…………..to him………..